The Royal Standard Typewriter is the ideal machine for the Author or Journalist, because of its versatility - added convenience. A literary man MUST be original: he should use the writing machine whose whole keynote is originality. The Royal is not made especially for the use of writers, but for EVERYBODY who needs a typewriter. It is essentially the businessman's machine, complete in every detail. You've heard of the "master key" that fits every lock - did you ever hear of a Master-Model of a typewriter? One Typewriter With the Combined Advantages of Many! Think of all the combined advantages of several typewriters you have seen, concentrated in ONE standard writing-machine that handles perfectly every known form of general correspondence and does card-writing and condensed billing besides - without a single extra attachment to complicate the mechanism or add extra cost to your typewriter equipment - and you will have a fairly good conception of the MASTER-MODEL of the Royal! Write for the "Royal Book" - or send for a "Royal Man"
A literary man MUST be original: he should use the writing machine whose whole keynote is originality. Which is why I used a Royal Standard Typewriter to compose this post. I simply thought about it and the machine responded with original text. It's magic! And with the Royal Standard Typewriter I never experience the blue screen of death, so common with inferior machines of later invention. 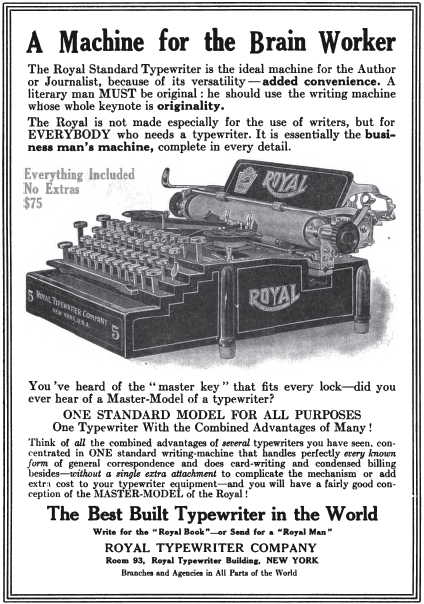 Full Disclosure: In 1913, the year this advertisement appeared and thirty-eight years before I was born, I received a lifetime supply of typewriter ribbons from the Royal Typewriter Company in exchange for product placement and personal endorsement.